Nandor and Guillermo out shopping. For all their fey theatrics, traditional vampires—your Draculas, Lestats, and Vampires Bill—are pretty straightforward. They’re dead, sunlight kills them, and they need to feed on the blood of the living in order to keep chugging along. These are the kinds of vampires you can take precautions to protect yourself from. Stakes and garlic are cheap enough to get ahold of and if you wanna get fancy about it, you can invest in a spray bottle of colloidal silver to use as mace. They’re not really all that interested in your blood, but they delight in boring people to death or driving them insane with their never-ending small talk and social awkwardness. These creatures walk among us. The trailer also introduces the rest of the show’s properly undead or otherwise supernatural cast who are similar to the characters from Taika Waititi’s original film about vampires living in New Zealand, but are also very much their own people. Nandor (Kayvan Novak), Laszlo (Matt Berry), and Nadja (Natasia Demetriou) are a trio of misanthropic vampires living in New York City and struggling to adapt to the modern day world. Guillermo (Harvey Guillen), Nandor’s familiar and human assistant, does what he can to help his liege get by, but there’s only but so much a centuries-old vampire can do to break out of his old, literally undying habits. 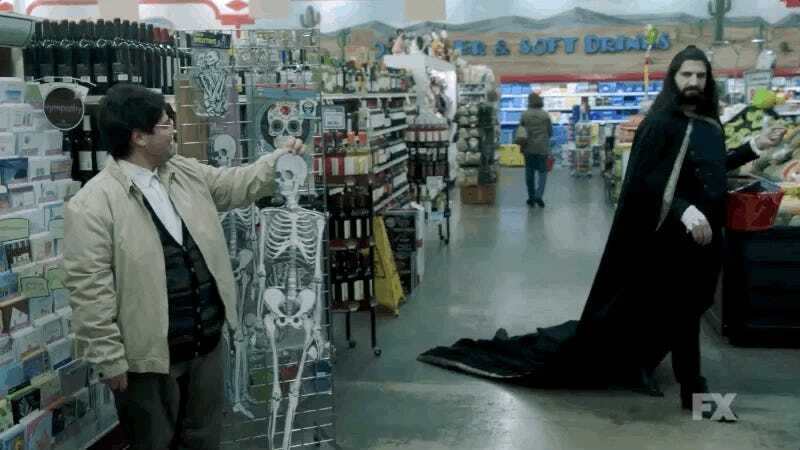 The trailer hits a couple of beats from Waititi’s film, but considering how different the settings of the respective stories are, there’s a more than solid chance that FX’s What We Do in the Shadows is going to venture into some new territory when it drops on March 27.